@JamisonFaught said on Twitter: This is what @SamaritanMin looks like. ~55 families shared all of my emergency appendectomy costs. Praise the Lord! 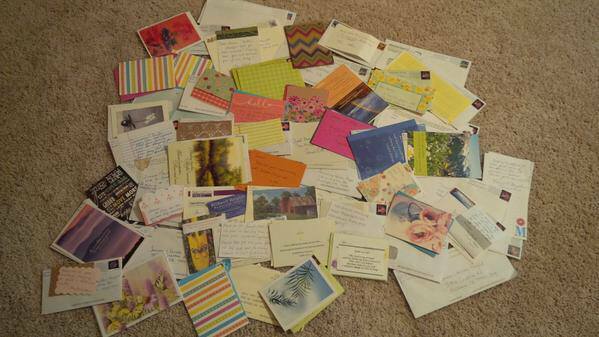 http://abundanceofpraise.blogspot.com/2014/09/rejoicing-in-hope.html – This one is amazing as it details the $300,000 need for their newborn, all paid for by Samaritan shares, and shows a picture of the 360+ cards/letters they got. So incredibly awesome! Samaritan has videos of members (click to mysamaritanstory.org to see them) who have gone through various medical issues, some of them quite large, and each member gives their video testimony of how that journey was supported by Samaritan. I was struck by how significant some of these medical issues were, very big problems like heart issues, long term cancer treatments and more, and those members were fully supported financially and spiritually by Samaritan. I was also amazed at how almost all of them mentioned how important the personal interaction of sharing member to member became to them. It was clear that the notes, cards and prayers were just as important, maybe even more so, than the financial healing was. That is an aspect of Samaritan which just cannot be duplicated by insurance companies and I’m so happy to be a part of it. The overwhelming theme from all the blogs, websites and forums I read was that members of Samaritan Ministries gushed their love for the program. During my research I could not find a single outright negative review by a member. I did find a few non-members who were skeptical, thought it must surely be false, and generally had no faith in it. But the message that really counts is the one from actual members who are really receiving money for their bills. These people were so thankful, so grateful, so blessed and most said they would never go back to regular health insurance. I even found a member who obtained military insurance and thus didn’t keep his Samaritan membership, but he pays $1/month to continue getting the monthly newsletter because he enjoys it so much and he continues to send money to members with Special Prayer Needs. The impact of being a member is so profound for many people they just can’t imagine leaving. That kind of review speaks very loudly to me. If the program was false or a problem or failing then I would have found people who weren’t happy. I couldn’t find them and I’m very very good at internet research. At one point I thought I had found a negative review, but it turns out that while they said it was about Samaritan, it was actually about one of the other healthcare sharing ministries. So that put me back to zero negative reviews so far. Are there some? Statistics say there probably are, but it appears any that exist are very few and far between. I find that very comforting. Money to pay the bills will likely arrive 3 months after you suffer the need, 2 months if you have instant medical bills (not likely). Because of this you will need to be able to cash flow a small monthly payment to your providers. We are actively part of the bill receiving and payment process. Most people aren’t used to that as insurance transactions happen behind our back. It takes some getting used to having those large bills come to your house. Most pre-existing conditions must go 12 months without treatment, symptoms or medications before coming out of “pre-existing” status. A couple of them require longer times (heart related and cancers are 5 years, type 1 diabetes is always pre-existing). If you have a need you will get cards and money in the mail. Most would say, “Great!”, but it can be a lot of cards and money in the mail. A $25,000 need after discounts would be at minimum 50 cards assuming everyone sent $495 (which they won’t as several smaller checks will also be assigned). Some people may find that to be a burden. I personally think it would be a lot of fun to read all those cards, mark off the checklist, and deposit checks. Not to mention the satisfaction of paying those medical bills off so soon. You could have 100 households all praying for your healing. The power of that is so humbling. You are technically uninsured. But a great quote I found from another member says that Samaritan is “Assurance” not “Insurance”. So TRUE! Samaritan provides assurance that our needs will be covered. It’s not a contract with a for-profit company who’s primary goal is profit at your expense, it’s a promise from a group of Christian who’s sole purpose is to support you in your time of need and get your medical bills paid. Wrap yourself up in that thought. No fighting over contract details and denials. Just people of faith praying for you, sending you money and all in the name of God. When you think about it, this assurance puts your medical needs on an even more solid financial footing than corporate insurance does. UPDATE: I found a member story who was disappointed that 4 families didn’t pay their share by the middle of the month as they are supposed to. It sounds like 3 of the 4 paid later in the month, and 1 didn’t pay and likely had to be reassigned. She is still happy being a member and recommended it. It highlights the importance of being able to cash flow the small monthly payments to our providers for those first couple months until all the shares come in. Even though our personal responsibility is only $300, we should still have a rainy day fund which can be touched while shares are coming in. Our family has a small medical savings fund to cover the non covered items like dental, and we can draw from that to pay hospitals a small good-faith amount until the shares from members come in. The huge monthly savings we have between Samaritan and our former insurance allows us to put a regular amount into that medical savings fund each month.